Gigli wire is a flexible cutting wire with a toothed edge used to cut hard materials such as Fibreglass casts, bone and horn. Standard grade stainless steel saw wire, with a loop at each end for ease of use when attaching to gigli handles. 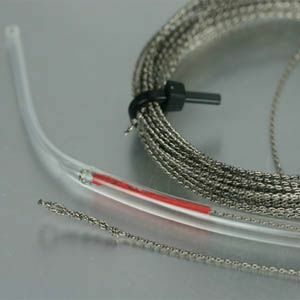 50cm and 70cm lengths of Gigli wire are threaded down a plastic sheath, this facilitates the removal of the casting materials at a later date. Sheaths can be removed and cut to more suitable lengths if required. 70cm Non-sheathed wire is ideal for removing bone and horn. Wire and handles can be autoclaved for sterile procedures. 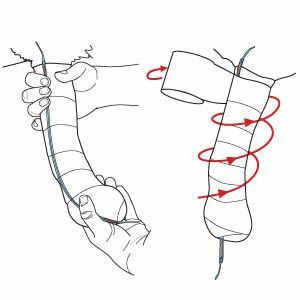 Align gigli wire over padding on the dorsal aspect of the limb, leaving the red tape exposed at each end. Apply casting tape over the gigli wire leaving the red tape exposed at each end. 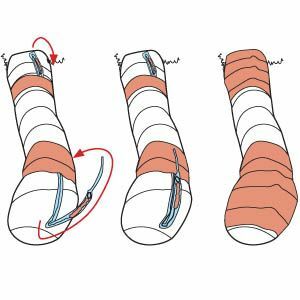 Fold over both distal and proximal ends of the exposed gigli wire and secure to the casting material with tape (this will help prevent the wire becoming damaged or chewed). Cut off looped ends and attach handles to the exposed wire for ease of removal. The wire will now cut with ease through the plastic sheath and casting material using a sawing motion.